New research has expanded our knowledge of the benefits of exercise for most cancer patients. It is well known that some of the most devastating consequences of the treatment for cancer are the loss of both bone density and lean body mass, as well as weight gain. This may be due to the direct effects of the cancer, the treatments (including chemotherapy), or just the reduced activity. This in turn can lead to an increased risk for developing new diseases. In addition, patients are unfortunately at risk for recurrence of cancer due in part to impairment of the immune system. 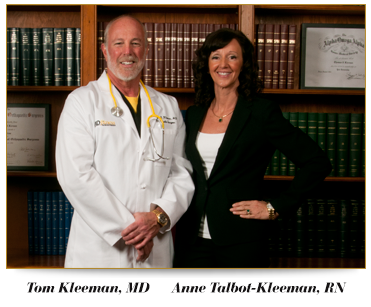 As a cancer survivor himself, Dr. Tom Kleeman is committed to helping cancer patients restore and maintain the best possible quality of life. Research continues to show that the type of exercise found in The Doctors Workout will help to achieve that goal. Read Tom's personal journey overcoming cancer here. 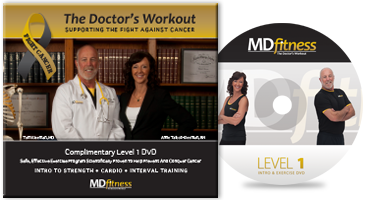 MDfitness is offering a complimentary Level 1 DVD of The Doctor's Workout to any patients that feel they would benefit from a safe, effective exercise program scientifically proven to help them prevent and conquer their cancer. While supplies last.